Jacques Kallis made his swansong match a memorable one by hitting his 45th Test hundred as India faced a daunting task of batting out the entire fifth day to save the series-deciding second Test against South Africa in Durban. 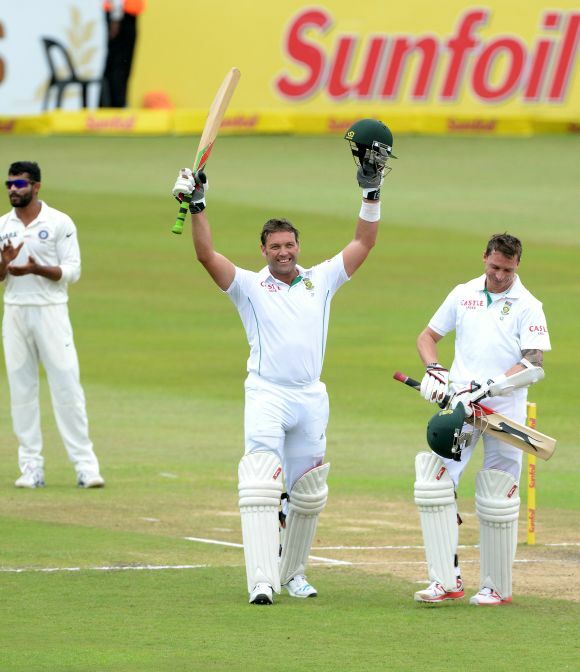 Kallis ensured that he left the Test arena in a blaze of glory with a fluent 115 as the home team posted a mammoth 500 in their first innings to take a sizeable 166-run lead. India lost both the openers Murali Vijay (6) and Shikhar Dhawan (19) before reaching 68 for two on yet another rain-marred day, still needing 98 runs to avoid the ignominy of an innings defeat. Cheteshwar Pujara (32) and Virat Kohli (11) will resume India's battle on Monday. 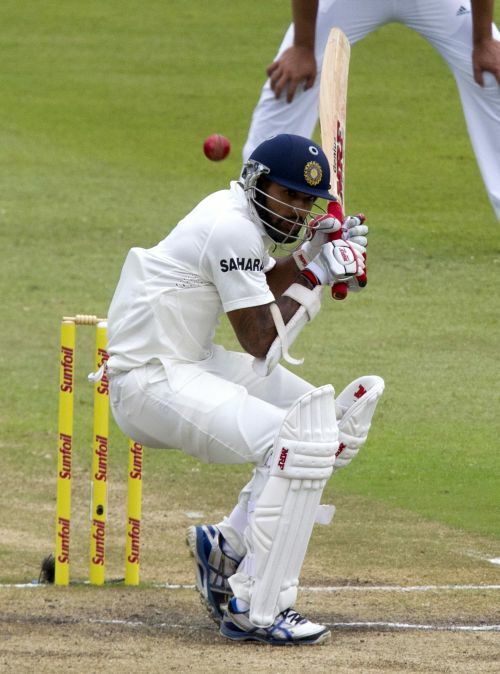 Pujara and Dhawan had batted with caution after paceman Vernon Philander had Vijay caught in the slips. But Faf du Plessis took a spectacular one-handed catch to send back Dhawan, who played uppishly in the mid-wicket region and failed to clear the fielder. It was yet another waste of a watchful start by Dhawan, who ended this Test series with scores of 13,15, 29 and 19. With one day left in the match, the visitors have to bat out the final day to share the honours in the two-match series. 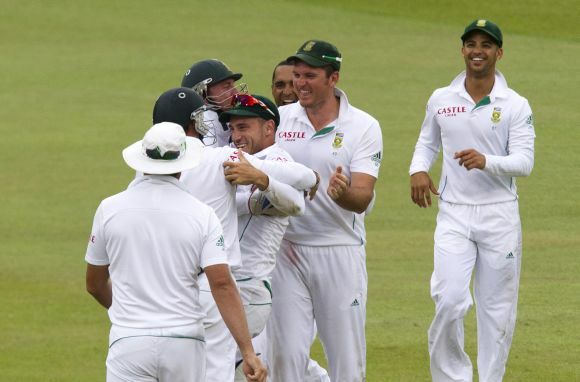 The first Test in Johannesburg had ended in a thrilling draw. South Africa on the other hand need to take eight wickets on a tricky fifth day track at the Kingsmead to give Kallis a perfect gift in his farewell match. Beginning at the overnight score of 299 for five, Kallis scored 115 off 316 balls with 13 boundaries while lower-order batsman Robin Peterson played a 61-run cameo before their innings folded for exactly 500. (0-11) bowled well with the new ball, getting more pace, bounce and movement than the Indian attack earlier on, yet could not get anymore breakthroughs. Dhawan was more watchful than usual, carefully leaving deliveries he did not need to play at. Pujara was his resilient self, playing for time. The two batsmen silently put on 45 runs for the second wicket, successfully negotiating the initial pace barrage. After Dhawan's dismissal, Kohli joined Pujara in the middle and India’s two best batsmen on display avoided further damage, putting on 15 runs off 49 balls. 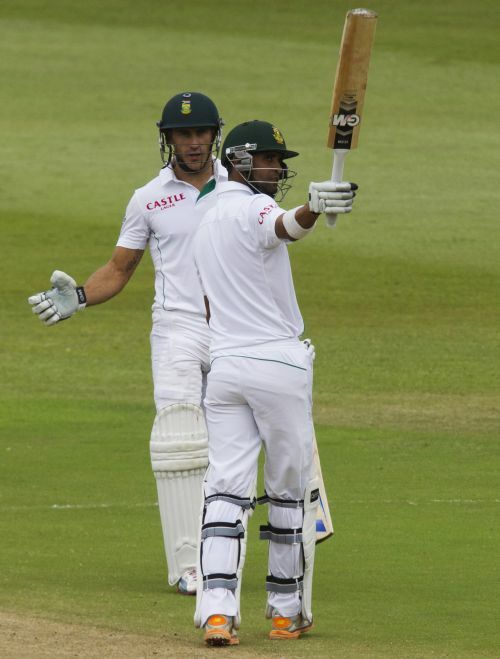 Earlier in a rain-interrupted first two sessions of the day, South Africa finished at 500 all out. Shortly after resumption of play post-tea, Faff du Plessis (43) was run-out by a direct throw from Rohit Sharma. Morne Morkel (0) was caught and bowled by Jadeja, who garnered his best bowling figures in a Test innings. He took 6-138, beating his previous best of 5-58 against Australia at Delhi earlier in 2013. Zaheer Khan (2-97) picked up a wicket on either side of lunch. 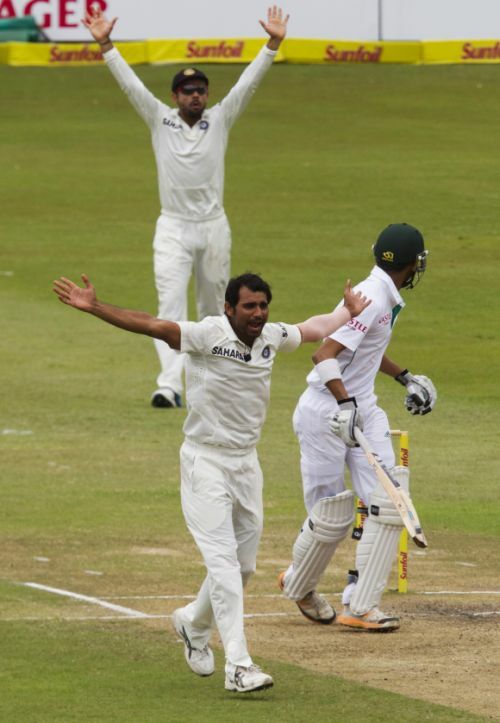 Mohammad Shami (1-104) was taken for runs after the second new ball, as was Ishant Sharma (0-114). Rohit (0-29) was the only other bowler tried. Before the tea-break, Robin Peterson smacked a quick-fire fifty to help build the lead with du Plessis, putting up 110 runs at 6.11 runs per over. Starting at 395/7 after play was again delayed by fifteen minutes post lunch, Peterson and du Plessis looked for runs as against the approach seen early in the day. The first over after the break bowled by Zaheer was taken for two boundaries and the batsmen attacked Jadeja as well. India delayed taking the new ball still, keen to play for time and force a draw. But five overs later, in the 147th, the two umpires decided to change the ball. The effects were there to see as the 50-run partnership came up in the same over, bowled by Shami, even as Peterson should have been given LBW. He was on 31 runs at that time and went on to cause mayhem afterwards. 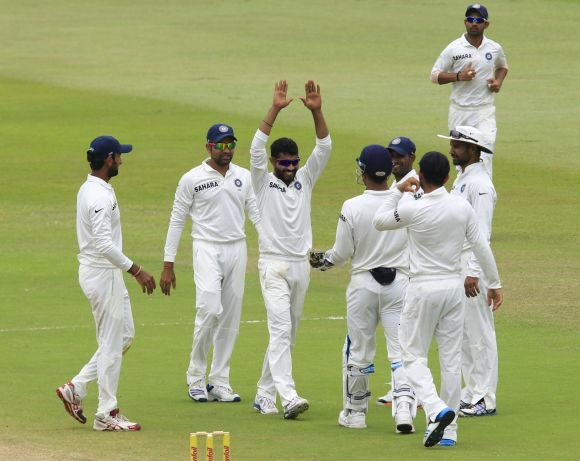 The new ball also meant that Jadeja’s marathon spell came to an end during which he returned figures of 25-8-53-2. Peterson brought up his third Test half-century in the 152nd over, and their 100-run partnership in the very next, as 77 runs came in less than one hour of play after the lunch break. He even hit Rohit Sharma for a switch-hit six, the match’s first after nearly four hours of play. He fell three balls later, out caught trying to hit Zaheer off the park, even as rain came down to cause another disruption. 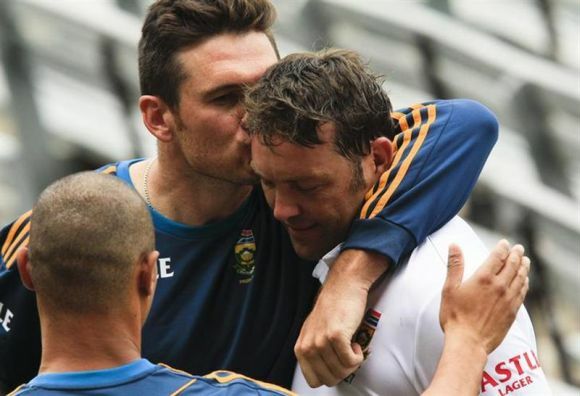 This was after Kallis brought up his 45th Test hundred in the pre-lunch session. He went past Rahul Dravid’s tally of 13,288 runs in 164 matches by one run, to end up as the third-highest run-getter in Test cricket history. Kallis started the day slowly, and had a nervy moment against Jadeja in the 130th over, nearly playing the ball on to his stumps, before flicking to square leg for a single and bringing up his century. He scored 100 runs off 273 balls, batting for 334 minutes and hitting 13 fours. In the next two overs, he brought up his 50-run partnership with Dale Steyn (44) for the sixth wicket, as his good friend played the night-watchman duty properly. It was in the 133rd over, against Zaheer, that Kallis went past Dravid as he played a deliberate late cut past slip. Perhaps that was his big target, for in the very next over, he went for an uncharacteristic big shot against Jadeja and holed out. It brought an end to his batting career, for a second innings seems impossible at this stage, even as his team-mates came out of the dressing room to embrace him.